This week is International Fraud Awareness Week. We’re kicking things off and spreading the word on the fight against fraud by bringing you one fraud fact (and story) each day this week. Today’s fraud fact is Collusion = Bigger Frauds. And boy oh boy, does that ever ring true with this financial fraud fiasco. It’s a doozy! Six banks are set to pay $4.3 Billion (yes you read that right) in the first wave of currency-rigging penalties… yes first wave of penalties. We brought you this story last week, but lets expand on it. According to the ACFEs 2014 Report to the Nations, collusion helps employees evade independent checks and other anti-fraud controls. This enables them to steal larger amounts. Even though more than half of the frauds in the study were committed by a single person, when more people got together to commit fraud, losses rose dramatically. Also, when fraudsters are working together, there are more people expecting a payout, which could explain why losses are higher – more money, more money, more money! Citygroup Inc, JPMorgan Chase & Co., USB AG, Royal Bank of Scotland Group Plc, HSBC Holdings Plc, and Bank of America are the players in this formidable financial fraud failure. These banks, and many individuals, could face further penalties and litigation. This is the result of a 13-month probe into allegations that dealers at these big banks colluded with counterparts at other firms to rig benchmarks used by fund managers to determine what they pay for foreign currency. There are still criminal probes being undertaken into the (gasp) $5.3 trillion-a-day currency market. These colluders really went all out in this one, even coming up with chat group names – The 3 Musketeers, 1 Team 1 Dream, and The A-Team… pretty sure “Baracus”, “Mad Murdock, and “Hannibal” had nothing to do with this one. These chat rooms showed traders sharing client orders and attempting to rig the WM/Reuters currency benchmarks. According to the ACFEs Survey, 77% of frauds were committed by individuals working in a few key departments, two worth noting – accounting, and purchasing & finance, just like our six banks. Download our ACFE Key Fraud Findings Checklist giving you 10 quick fraud facts. It’s a one-pager. Print it out, pin it up. 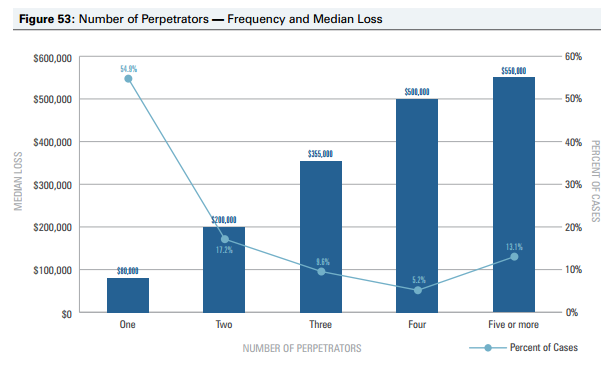 No matter your business size, industry, or location, occupational fraud and abuse hurts. It hurts real bad.